Mood Tracking is a newer concept for me, and I think it is with a lot of people. Since January I have been tracking my moods using a method called year in pixels. 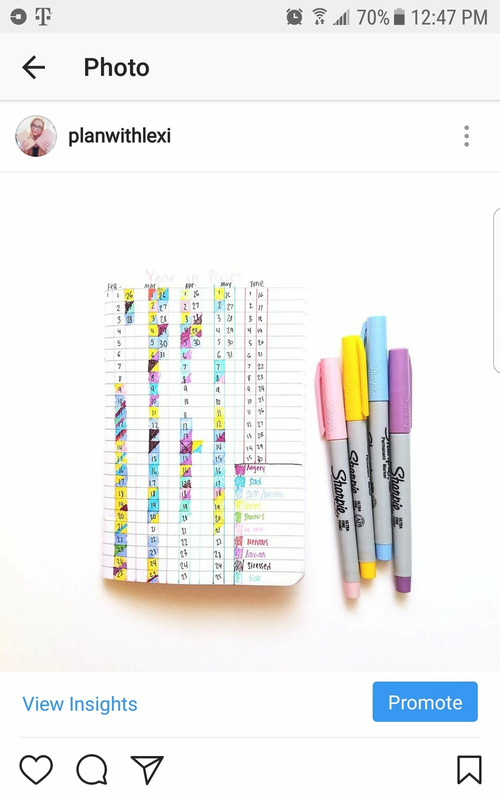 Year in pixels is a popular bujo (bullet journal) method. You split up the months and the days become your "pixels". It's like a calendar but more compact. There's usually a key at the bottom for color coding each of your moods. At the end of the day, check in with yourself. You can do half and half or the whole day one color. I've split it up into 3 colors per day before, but it got messy quick. You can get as creative as you want with the layout too. In addition to my year in pixels, I have a journal as well. This is where I write down the specifics of how my day went and why I chose that specific set of moods. To see a set up video of the planner I have for this you can view it below. So how does this help my productivity ? When you have something like anxiety, tend to have mood swings often, or even if you don't it's huge to be able to discover patterns in your moods. I've noticed quote a few of them with this mood tracking & journaling combo. I am able to see what times of the month I'm most productive, what makes me unmotivated, and so much more from this simple method. When I check the journal in relation to the tracker I can clearly see what makes me anxious, what gets me stressed out, why I'm sad, and what makes me happy. Knowing this information I can work on creating habits for better moods. As well as learning how to solve certain issues when my moods aren't so hot. I would highly recommend for everyone to at least try this system out. It has made a surprising impact in my life because it's clear data right in front of you.